This edition of ASAP Utilities is for companies and governments. We offer a free 90 day trial version with functionality. To continue to use it after the 90-day trail period, simply purchase a license key. The free "Home&Student" edition of ASAP Utilities is free to use for home projects, schoolwork and charitable/non-profit organizations such as for example MSF and Amnesty International. Especially with providing it for free to students and charitable organizations, we hope to contribute to a brighter future. 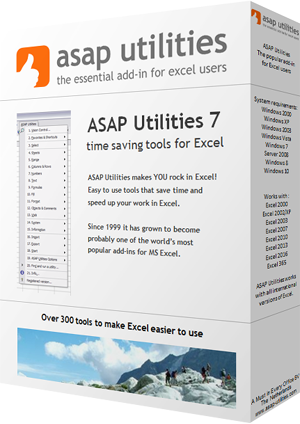 ASAP Utilities exists since 1999 and is used in a variety of organizations. We're proud to mention that our list of clients exceeds 20,000 organizations in more than 140 countries worldwide. Your contribution helps us to further develop and improve ASAP Utilities.